368 pages | 75 B/W Illus. "This is a real 'how to' book by two people who really know how. But it is more than just a fine manual on broadcast journalism, journalists and non-journalists alike will find it good read, a treasure chest of anecdotes, stories and a tall tale or two from the most exciting profession of all—reporting the news." 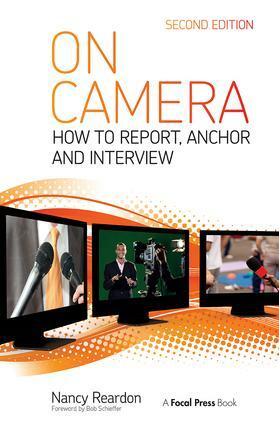 Reardon’s On Camera: How to Report, Anchor & Interview teaches you how to become professional and effective on camera. You’ll learn how to appear and feel at ease whether doing an interview, reporting in the field, reading from a prompter, or giving a video presentation. It’ll give you the nuts and bolts of how to do the job at the network level or as a backpack journalist, so you feel confident that when you’re standing in front of the camera you will know what you’re doing. Whether new to television or experienced in front of a camera, you will improve on your current skills through career-focused tips and tried-and-true principles—all oriented to skills development—in this book. Introduction. I: Interviewing. 1. Interviewing. 2. The Interviewee. II: On Camera Reporting. 3. Gathering the Facts. 4. Writing the Script. 5. Presenting the Report on Camera. III: Beat Reporting. 6. Sports Reporting. 7. Weather Reporting. 8. Medical Reporting. 9. Legal Reporting. 10. Entertainment Reporting. 11. Business Reporting. 12. Anchoring I. 13. Anchoring II. 14. Hosting. IV: Voice and Physical Technique. 15. The Voice Itself. 16. Techniques for a Good Reading. 17. Physical Techniques. 18. Looking Good. V: Getting the Job. 19. Preparing Your Presentation Reel. 20. How to Land a Job in Television, by Melinda Murphy. 21. Final Thoughts. Nancy Reardon lectures at The New School in NYC and New York University. Reardon created the first university course (The New School) for on camera presentation more than twenty years ago. Reardon lives and works in New York City.